Can Hair Loss Due to Hormone Imbalance be Reversed? Our hormones do a lot of work for us beyond making teenagers moody and distracted. Throughout our lives, hormones continue to perform vital functions for our overall health and well-being. But our bodies are imperfect machines and can either produce too many or too few of the hormones we need. These imbalances can throw normal processes out of whack, including the natural hair growth cycle. Many cases of hair loss can be traced, in whole or in part, to hormone imbalances. Fortunately, medication and other treatments are available to restore balance to hormones and restore hair lost because of overactive or underactive hormone production. How Do Hormones Affect Hair Growth and Loss? A synthesized version of testosterone, DHT plays a role in sexual development and physical appearance. When too much testosterone gets converted into DHT, the natural growth cycle of hair is disrupted, causing hair follicle shrinkage or elimination and ultimately resulting in shedding or thinning hair. Menopausal hair loss. Women going through menopause produce lower levels of estrogen and progesterone – two hormones critical for hair growth and follicle health. As these hormone levels decrease, hair growth slows while follicles become thin, brittle, and more vulnerable to damage. Making matters worse, the decrease in hair-promoting hormones is accompanied by an increase in androgens – hormones which trigger follicle miniaturization on the scalp. This miniaturization makes hair more susceptible to falling out. Insulin Resistance. When the body fails to regulate insulin production properly, the body can build up a resistance to this hormone, which can, in turn, lead to an increased risk of androgenetic alopecia, or pattern baldness. If you are experiencing hair loss and want to address the issue, the first step is identifying the causes behind the problem. Your physician plays an indispensable role in that process, including testing you for hormone and glucose imbalances. If you are indeed having trouble with hormone production, your doctor can prescribe medication which can help restore balance. Lifestyle changes, such as a healthier diet, exercise, and stress reduction will also help you get your hormone levels back on track. Once equilibrium is restored to your hormones, hair loss associated with your hormone issue should slow or cease, and in many cases, hair that was loss may be replaced by new growth. Additionally, many treatments we offer at the Hair Transplant Institute of Miami to treat other forms of hair loss are equally effective at addressing hair loss caused by hormonal imbalances. These can include hair transplant surgery, low-level laser therapy (LLLT), or hair loss medications. Given the complications involved in hormone disorders and their treatment, only a consultation and full evaluation with an experienced hair loss physician can tell you which hair restoration treatment would be best for you. If a hormone imbalance is contributing to hair loss, the Hair Transplant Institute of Miami can help. We offer a range of effective treatments, customized to your individual condition. To receive a personalized evaluation and treatment plan, contact us online or call our office directly at 305-925-0222. Life is full of inevitable and unavoidable transitions. For women, menopause is perhaps the most impactful of these changes – physically, psychologically, and emotionally. Many aspects of menopause caused by fluctuating hormone levels are uncomfortable and undesirable, including hot flashes, mood swings, and irregular menstruation. For a lot of women, menopause also leads to hair loss. This can make the experience even more stressful and challenging, which in turn can make hair shedding even more noticeable. 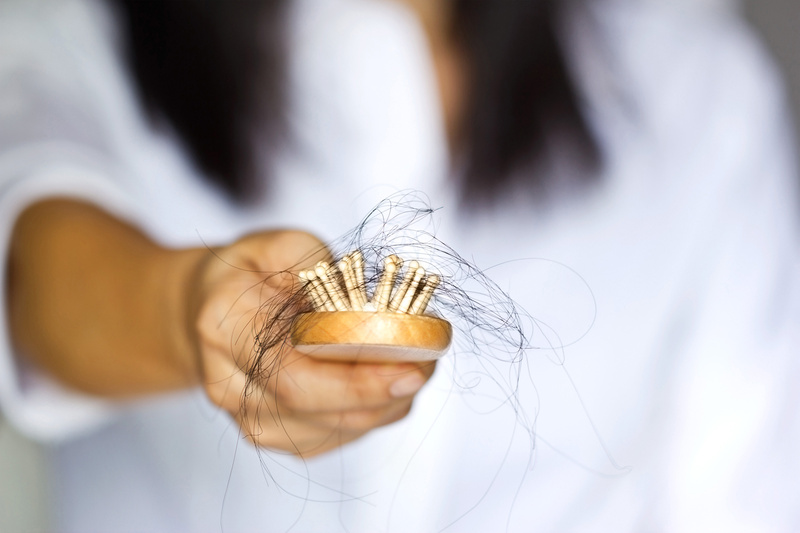 What Causes Menopausal Hair Loss? Women going through menopause produce lower levels of estrogen and progesterone – two hormones critical for hair growth and follicle health. As these hormone levels decrease, hair growth slows while follicles become thin, brittle, and more vulnerable to damage. Making matters worse, the decrease in hair-promoting hormones is accompanied by an increase in androgens – hormones which trigger follicle miniaturization on the scalp. This miniaturization makes hair more susceptible to falling out. Fortunately, menopausal hair loss is treatable. The Hair Transplant Institute of Miami understands how draining this life change can be for women, particularly when it includes hair loss. We work with female patients to proactively restore their self-esteem through early detection, professional diagnosis, and optimal treatment methods. These treatments include non-surgical hair restoration methods such as Minoxidil (available by brand name Rogaine®), which has shown success in slowing or stopping hair loss in women. Low-level laser therapy for hair (LLLT) is a second non-surgical restoration method that can reduce hair loss and, in some cases, stimulate new hair growth in women. Safe, painless, FDA-approved lasers promote blood flow and nutrient delivery to the hair follicles, strengthening and encouraging follicle growth. Women are particularly fond of these “laser therapies for hair loss” because they are quick, convenient, safe, and effective. Finally, women may elect to have hair transplant surgery, a procedure during which the patient’s own hair follicles are extracted from areas of healthy scalp and relocated to areas experiencing thinning or balding. Early detection, diagnosis, and treatment provide the best chance for women to restore their hair to its naturally full, resilient, and beautiful state. To move forward with a hair loss evaluation, call the Hair Transplant Institute of Miami today at 305.925.0222 to speak directly with a member of our team. What is Menopausal Hair Loss? Hot flashes, mood swings, irregular menstruation – menopause is a stressful time in any woman’s life. One of the lesser-known side effects during the change of life is menopausal hair loss. As the body adjusts to fluctuating hormone levels, women may notice general thinning and shedding across the scalp. Unlike male-pattern baldness, which typically materializes on the hairline and crown, menopausal hair loss is diffuse. 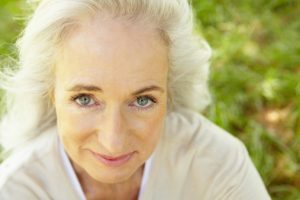 When menopause hits, women produce lower levels of estrogen and progesterone – two hormones responsible for hair growth and follicle health. As these hormones dip, hair growth slows while strands become thin and brittle. After estrogen and progesterone levels fall, androgens (male hormones) increase. Androgens trigger follicle miniaturization on the scalp. Sometimes, androgens cause an increase in facial hair, which is why women suffering from menopausal hair loss may concurrently experience fine fuzz around the chin and upper lip. Fortunately, menopausal hair loss is treatable. The Hair Transplant Institute of Miami understands how draining the change of life can be, particularly when hair loss appears as a side effect. We work with female patients to proactively restore their self-esteem through early detection, professional diagnosis and optimal treatment methods. Our physicians, Dr. Bernard Nusbaum and Dr. Paul Rose, are two recognized leaders in the field of hair restoration. We thoughtfully listen to patients’ concerns and objectives while providing hair loss treatment suggestions that best suit your diagnosis, lifestyle, expectations and goals. At our state-of-the-art facility, we are proud to offer natural-looking hair transplants backed by the latest technologies, professional-grade laser therapy caps for at-home use and stem cell hair growth treatments, among other innovative medical hair therapies. To book your appointment for menopausal hair loss treatment, call our office at 305-925-0222 today. Hair loss is a lesser-known side effect of menopause. Most commonly, women and physicians associate menopause with other side effects like hot flashes, emotional swings, and significant menstrual cycle changes. Unfortunately, hair loss during menopause is a common occurrence that presents a very real threat to mental and emotional health. Androgenetic alopecia, or pattern baldness, occurs differently in women than it does in men. Simply compare the Ludwig Classification (for female hair loss) with the Norwood Classification (for males), and the difference is quite clear. For men, pattern baldness typically begins with a receding hairline and progresses toward loss of hair at the crown of the head. For women, however, hair loss can be much more difficult to detect. When a woman begins to lose hair, it usually happens in a more spread-out and diffuse manner along the top portion of the head. For this reason, many women do not recognize the [signs of female hair] loss until long after it has already begun. With this in mind, here are 4 things to know and understand about hair loss during menopause. Hormonal fluctuations are known to cause hair loss in both men and women. For men, increased DHT production is usually the culprit responsible for the development of pattern baldness after age 40. Pregnant women sometimes experience the opposite, as pregnancy causes a surge in healthy hormones that can cause hair to become thick, rich, and vibrant. During menopause, the body’s production of estrogen and other female hormones begins to decline. This causes a relative rise in androgens, or male hormones, which ultimate puts women at risk for developing hormonally induced hair loss. Of course, hormones are not the only factor to consider. Certain elements of lifestyle might also contribute to hair loss during menopause. Most common is stress, which can lead to a specific type of hair loss referred to as telogen effluvium. 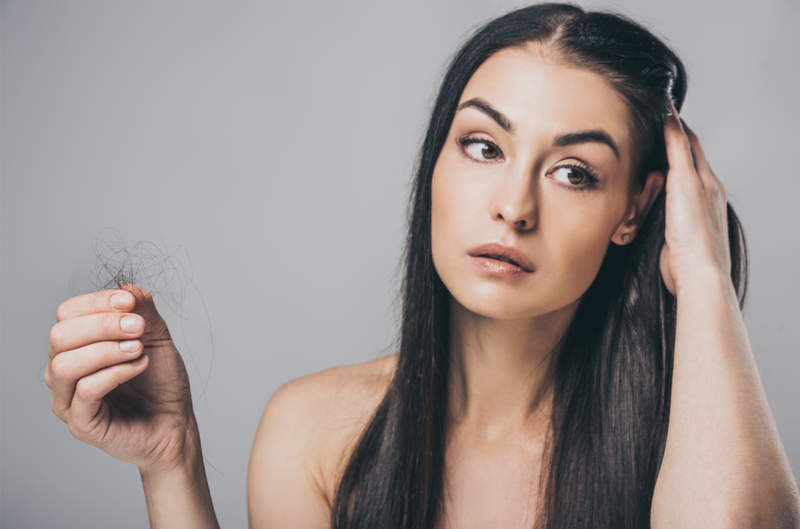 Telogen effluvium appears to occur when stress “shocks” the hair follicles into a dormant state in which hair no longer grows, according to the American Hair Loss Association. Taking proactive steps to reduce daily stress can help. Yoga, meditation, journaling, and quiet time alone are all activities that numerous studies associate with low levels of stress. Hair loss can cause serious mental and emotional health issues for both men and women. It’s vital to understand that such side effects are normal; the hair, face, and teeth are among the first characteristics one individual will notice about another. Together, they help to establish a first impression and, in some cases, a certain level of attraction. Not surprisingly, men and women can feel anxious, embarrassed, and depressed when the health and aesthetics of the face and hair are compromised. There are two very important things to remember, however. First, stress has a way of exacerbating hair loss (see above). For this reason, women who notice symptoms of thinning, shedding, or balding during menopause are smart to remain calm and consult a physician. Second, women must remember that hair loss during menopause is treatable. There are a variety of treatment protocols available for women who notice thinning, shedding, or balding during menopause. When it comes to non-surgical hair restoration methods, Minoxidil (available by brand name Rogaine®) has been shown successful in halting hair loss for women. Minoxidil is a topical foam that must be applied to the scalp daily, however, which becomes tedious for some women. Low level laser therapy for hair is a second non-surgical restoration method that has demonstrated an ability to reduce hair loss and, in some cases, stimulate new hair growth. LLLT exposes the scalp to safe, FDA-approved lasers that are designed to stimulate blood flow and nutrient delivery to the hair follicles. Women are particularly found of these “laser therapies for hair loss” because they are quick, convenient, safe, and effective. Finally, women may elect to have a surgical hair restoration procedure to permanently reverse signs of hair loss. Surgical hair restoration is most commonly performed as a hair transplant, a procedure during which the patient’s own hair follicles are extracted from areas of healthy scalp and relocated to areas of thinning or balding. Surgeons transplant each follicular cluster (sometimes as small as 1-3 units) by hand, effectively camouflaging bald scalp with real hair that looks, feels, and grows naturally. Early detection, diagnosis, and treatment provide the best chance of restoring hair to its naturally full, resilient, and beautiful state. To move forward with a hair loss evaluation, schedule an appointment with the Hair Transplant Institute of Miami. Our team represents South Florida’s finest surgeons, registered nurses, and technicians, each of whom hold your pursuit of a fuller head of hair in the highest regard. Readers may also call our Institute at 305.925.0222 to speak directly with a member of our team. Supporter of the International Society of Hair Restoration Surgery. Share ideas and experiences on our sponsored Hair Loss Forum. Our doctors are recommended on the Hair Transplant Network. View our doctors' recommendations on the Hair Loss Learning Center. Share your experience by authoring a Hair Loss Website. Proud coalition members of the Hair Transplant Network Coalition. "Recommended by American Hair Loss Association." At the Miami Hair and Skin Institute, we hold every patient’s pursuit of a fuller and more natural head of hair in the highest regard. We are home to South Florida’s top hair transplant surgeons, doctors, nurses and staff. We are pleased to offer only the safest and most advanced methods of hair loss diagnosis and treatment. Please call our office directly at (305) 925-0222 or toll-free (877) 433-9070 to learn more. Copyright © 2019 Miami Hair & Skin. All Rights Reserved.